The panflute is among the most emblematic instruments of Andean music. The panpipes group include the sikú (or zampoña) and antara. These are ancient indigenous instruments that vary in size, tuning and style. Instruments in this group are constructed from aquatic reeds found in many lakes in the Andean region of South America. The sikú has two rows of canes and are tuned in either pentatonic or diatonic scales. 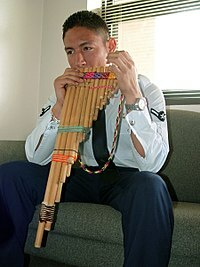 Some modern single-row panpipes modeled after the native antara are capable of playing full scales, while traditional sikús are played using two rows of canes wrapped together. It is still commonplace for two performers to share a melody while playing the larger style of sikú called the toyo. This style of voicing with notes interspersed between two musicians is called playing in hocket and is still in use today in many of the huaynos traditional songs and contemporary Andean music. Quenas (notched-end flutes) remain popular and are traditionally made out of the same aquatic canes as the sikús, although PVC pipe is sometimes used due to its resistance to heat, cold and humidity. Generally, quenas are played only during the dry season, while vertical flutes, either pinkillos or tarkas, are played during the wet season. Tarkas are constructed from local Andean hard wood sources. Marching bands dominated by drums and panpipes are commonplace today and are used to celebrate weddings, carnivals and other holidays. The twentieth century saw drastic changes in Andean society and culture. Bolivia, for example, saw a nationalistic revolution in 1952, leading to increased rights and social awareness for natives. The new government established a folklore department in the Bolivian Ministry of Education and radio stations began broadcasting in Aymara and Quechua. By 1965, an influential group called Los Jairas formed in La Paz, Bolivia; the quartet fused native sounds into forms suitable for urban Europeans and the middle class. One member of Los Jairas, Gilbert Favre (a Swiss-French flautist) had previously been an acquaintance of the Parras (Ángel, Isabel, and their mother Violeta) in Paris. 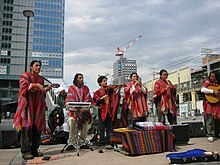 The Parras eventually began promoting indigenous music in Santiago, Chile. The 1970s was a decade in which Andean music saw its biggest growth. Different groups sprang out of the different villages throughout the Andes Region. Peru, Ecuador, Chile, Bolivia, Colombia and Argentina. Many musicians made their way to the big cities forming different bands and groups. One of the most legendary was Los Kjarkas, from Bolivia. Singing and composing songs that became huge hits in Bolivia and would later become Andean standards. They would later take Andean music to the rest of the world. Diablada - Originated in Oruro, Bolivia as sort of music typically associated with the diablada dance and its festivals. Tinku - Originated in Potosi, Bolivia from the ritual of violent sacrifice to the mother earth to ensure the best look, good fortune and the prosperity of the next seasons crops. K'antu - An ancient style of music and circle dance which is widespread since incaic or even preincaic epoch on the Peruvian and Bolivian highlands. San Juanito - Originated in Ecuador, Northern Peru and Southern Colombia, formerly related to solar cult. Huayno (wayñu) - Originated in colonial Peru as a combination of traditional rural folk music and popular urban dance music. High-pitched vocals are accompanied by a variety of instruments, including quena (flute), harp, siku (panpipe), accordion, saxophone, charango, lute, violin, guitar, and mandolin. Some elements of huayño originate in the music of the pre-Columbian Andes, especially on the territory of former Inca Empire. Huayno utilizes a distinctive rhythm in which the first beat is stressed and followed by two short beats. Huayno has some subgenres: Sikuri, Carnaval Ayacuchano, Hiyawa. Harawi - Ancient traditional musical genre and also indigenous lyric poetry. Harawi was widespread in the Inca Empire and now is especially common in countries that were part of it: Peru, Bolivia, Ecuador, partially Chile and Argentina. Typically, harawi is a moody, soulful slow and melodic song or tune played on the quena. Chicha - Originated in Peru the late 1980s as a fusion of cumbia and huayno music. Originally from the Caribbean coast of Colombia, cumbia became a hit in Peru and through much of Latin America. It was then adapted to a "Peruvian" version called "Chicha" that has become a popular style in the Andean region, specially among the lower socioeconomic strata of the society including Quechua and Aymara populations. Several Andean music genres have also borrowed elements originally introduced by the Peruvian "cumbia" such as electric bass guitars, electronic percussion and little from the original cumbia rhythm. Andean music has served as a major source of inspiration for the neo-folkloric Nueva canción movement that begun in the 1960s, Nueva canción musicians both interpreted old songs and created new pieces that are now considered andean music. Some Nueva canción musicians such as Los Jaivas would fuse Andean music with psychedelic and progressive rock. While the rock en Español wave of the 1980s and 1990s largely rejected Nueva canción and folklore in favor of hard rock, pop rock, punk, alternative rock and new wave sounds some elements of Andean music has been featured in rock en Español songs such as Cuando pase el temblor by Soda Stereo and Lamento boliviano by Los Enanitos Verdes. Wikimedia Commons has media related to Andean music.